Reason gives you everything you need to produce complete tracks without a plugin in sight. Here are eight proven techniques for making the most of its instruments, effects and mixer. Discover more pro DAW tips in the December 2016 edition of Future Music. Subtractor only has one output, so how can you make a convincing stereo effect with it? First, reach for the RV7000 reverb, and dial in a mono-to-stereo patch such as VOX Widerizer. The Softube Amp can also work in the same way. Another tactic is to use an audio splitter to duplicate the audio, panning the two outputs hard-left and hard-right. From here, create differences between the channels using short delays, low-intensity chorus effects or tiny pitchshifts. Use different settings on each side, and remember to sum the output to mono to check you haven't weakened the sound. If you've got tracks feeding into a Rack mixer, such as projects created prior to Reason 6, and you want to hook them up to the main SSL Mixer, it could take a long time to rewire everything around the back… Or, just delete all your old mixers, go to Edit>Select All Devices, then Edit>Auto-route Device, to have Reason do it all for you. To control Reason's functions with your QWERTY keyboard, go to Options>Keyboard Control Edit Mode, then select an item and set up a custom shortcut key for it. Remote Override Edit Mode does the same thing, but for controlling parameters with a MIDI controller. And if that's not enough, you also get Additional Remote Overrides, which let you set up MIDI controller parameters to complete other tasks - undo and redo, moving loop markers, patch selection, and loads more. The NN-XT sampler has more controls than the NN-19, and it's probably the first sampler you reach for, but one thing it can't do very well is automation. It gives you a few global parameters to automate - envelope, filter and master volume - but the NN-19 does a lot more. You can right-click (or Alt-click) almost any control on the NN-19 to create an automation lane in the sequencer, giving you control over Tuning, modulator Amounts, portamento, spread and more. You can also automate the Sample Start time for old-school time-stretching. Reason doesn't come with a multiband processor, but you can make your own. You'll need the right type of filter… At the back of the Stereo Imager, there are two outputs: the main Audio Output and a Separate Output. Use the switch to select Hi Band, and, at the front, select Solo Lo Band. Now, when you set the crossover frequency, you have separate outputs for each band. You can feed one band in turn to another Stereo Imager to create another filter, and repeat as many times as necessary. Route a signal to Kong's Audio Input and you'll get access to its Bus FX and Master FX sections. Send a signal to Thor's audio inputs and use the mod matrix to route Audio InL and Audio InR to Filter3. In Mälstrom, connect something to an Audio input, and you'll get access its filters for left and right channels, the Spread control and Modulator B. Go to the Propellerhead shop. Load all the items by scrolling down as far as possible, then Ctrl/Cmd-F and type FREE to zone in on the booty. 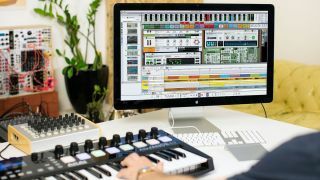 You may not be able to use all the latest hardware-modelled plugins in Reason, but that doesn't mean it's lacking in emulations. Certain Combinator patches in the Factory Sound Bank were created specifically to mimic classic gear such as the Electro-Harmonix Memory Man, Teletronix' LA-2A and the Juno chorus effect. There are also Combinators to download from the user community, mimicking classic plugin effects. You can have a look at a fuller list at bit.ly/ReasonEmu.